As you know, our Annual and Special Meeting of Shareholders will be held on July 23, 2008. This meeting is of vital importance to shareholders in light of the attempt by Scott Leckie, Daniel Owen and David Banks (the "Leckie Group") to seize control of your Board of Directors with their slate of five designees and three current Management directors. That group also has stated that it intends to replace your CEO with Mr. Banks as an interim CEO. The three Management directors have stated that they will not serve on a board nominated by the Leckie Group as they believe that Management's plan and its nominees continue to be the best option for shareholders. We believe that this action is unwarranted and unnecessary and that the Leckie Group unfairly presents the Company's performance in an effort to seize control of Zarlink for its own narrow interests without paying a control premium. Replacing an experienced board and senior management with individuals who have much less industry experience and lack understanding of the Company would have immediate and lasting negative consequences for Zarlink. The Leckie Group owns only 5.9% of Zarlink's outstanding shares, yet they seek to take control of Zarlink by seizing control of the Board and terminating the CEO while offering no concrete alternatives to the clear and articulated strategy that your Board and management have been executing since 2005. After three years of hard work, Management and the Board have positioned the Company to break-even in the first quarter of Fiscal 2009 and be profitable for the Fiscal 2009 year. Now is not the time for a sudden change in leadership, direction or strategy. Our strategy is starting to yield results, as evidenced by Zarlink's recent stock price outperformance. The Board and Management believe that the current Board and strategy present the best alternative for shareholders. The Leckie Group's "plan" is seriously flawed. The Leckie Group does not have the financial and operating experience nor track record to provide Zarlink with leadership and strategic direction. - David Banks: 6 of the 7 companies where he has served as a member of the board experienced share price declines since he joined. On average, this decline is 53% (companies include Newcourt, MediCure, Dynex Power, High Income, Cervus Financial and Nightingale. For companies that were acquired, share price performance represents performance from the date David Banks joined the board until the date the company was acquired.) Two companies sought protection from creditors under insolvency legislation while he was a director. - Daniel Owen and Neil Carragher: Technology board experience includes Westaim, the share price of which is down 95% since they joined the board. - Kalai Kalaichelvan and Luke Smith: No public company board experience. Moreover, Scott Leckie, who controls the largest amount of Zarlink shares in the Leckie Group, was fined by securities regulators as part of a settlement agreement pursuant to which he admitted to effecting trades in Air Canada shares where there was no change in beneficial ownership (also known as "Wash Trading"). The Leckie Group's "plan", as laid out in their proxy circular, imitates and endorses many of the actions that Zarlink has already accomplished or which are underway at the Company. In fact, the Leckie Group offers no plan of their own other than a laundry list that lacks tangible action items and clarity, and demonstrates that they do not understand the business, the industry or the Company. For example, while criticizing the product line-up of the Company, the Leckie Group does not identify any product opportunities in its circular, and only promises to "refocus spending to pursue identified product opportunities," and to "conduct a thorough and objective review of the Company's strengths and weaknesses." They promise to bring "successful leadership from the front" and "strong downward focused leadership" without explaining what these platitudes might entail. The information laid out in the Leckie Group's circular is also void of credibility and demonstrates a lack of understanding of the industry and Company by touting opportunities in an industry segment that is considered legacy, and calls for Zarlink to exit a business that the Company exited over five months ago. Since Zarlink is producing results that demonstrate that management and the Board are successfully executing on their clearly articulated strategy, the "opportunity" described in the Leckie Group's proxy circular entails significant risk for Zarlink shareholders. Calling for a freeze in corporate action in order to develop an understanding of the business and to create a strategic plan would put the brakes on the Company's positive momentum. Furthermore, the Leckie Group has said that it would install a temporary CEO with no semiconductor management operating experience, and has not identified any potential candidate to take on that role permanently. - Focusing the Business: Your Board and management are extremely active in evaluating our lines of business, product portfolio and the demands of an ever-changing market to ensure the Company is positioned for success. We have exited the money-losing set-top box, packet switching and foundry businesses, while adding key products and expertise to strengthen our portfolio. More than 50% of our products are growth rather than legacy products. The acquisition of Legerity provides us with market-leading technology required to deliver voice service over cable and broadband networks. - Targeting the Right Markets Through Full Solutions: We have successfully positioned Zarlink as a higher-value solutions provider delivering products that solve key problems for our customers. This includes new products targeting the fast-growing network timing, voice-over-packet, optical interconnect and medical wireless markets. - Establishing Clear Leadership in Target Growth Markets: Zarlink boasts key market-leading customers in each sector that depend on our products. For example, in the medical market, Zarlink is the only supplier with standards-based ultra low power radios for implantable medical devices. Through the purchase of Primarion's high-speed integrated circuits business, we added optical technology that has allowed us to be first-to-market with a new class of optical interconnect products for the data center and high performance computing markets. Through the Legerity acquisition, we gained a market-leading portfolio of voice interface products required by telephone and cable operators to deliver integrated voice, television and Internet services. - Despite the Leckie Group's claims, the Company has demonstrated revenue growth over the last few quarters, with gross margins stabilizing. Revenue is up approx. 13% in the last quarter and is expected to continue to grow in Fiscal 2009 with Q1 Fiscal 2009 expected to be up between 8% and 11% over Q4 Fiscal 2008. - Our strategy has driven significant operating expense improvements, with operating expenses declining an estimated 7% from Q4 Fiscal 2008 to Q1 Fiscal 2009, as indicated in the Company's May 2008 guidance. In the dissident proxy circular filed July 7, 2008 by the Leckie Group, Zarlink's financial results, product direction and strategy are in some cases completely misstated and, in many other cases, unfairly presented. Many comments show a complete misunderstanding of the industry and our Company. We view this as disturbing given that the Leckie Group wants the shareholders to entrust them to run the Company. - The Leckie Group claims that the Company's operating expenses are greater than the average of comparable companies - this is simply not true. 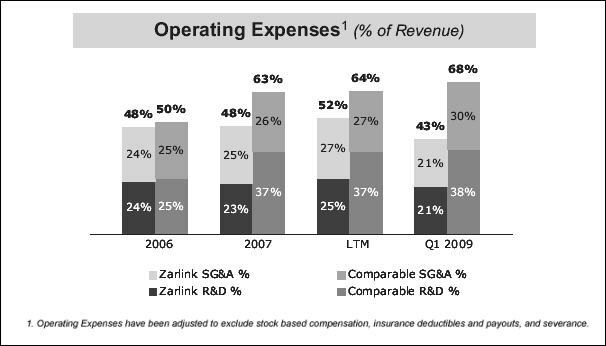 In the latest 12 months ("LTM"), Zarlink's R&D and SG&A costs were below those of its peer group as a percentage of gross revenue. - Furthermore, the Company has continued to improve operating expenses, bringing operating expenses as a percentage of gross revenue to an estimated 43% in Q1 Fiscal 2009, versus the average of its peer group of 68%. Under the strategy formulated by the current Board and management, Zarlink has made and continues to make great strides in its return to profitability. We expect to continue these efficiency improvements in order to drive further operating margin improvements and profitability throughout Fiscal 2009. - Medical/Wireless Circuits & Modules for In-Body Devices - Zarlink is the only supplier of standards-compliant low-power radios and modules for implanted medical devices supporting wireless healthcare monitoring and advanced therapies, and is the chosen supplier of the transmitter technology for the world's first swallowable camera capsule. - Network Timing & Synchronization - Zarlink is ranked in the top two suppliers of network synchronization products, with the industry's broadest offering of products. - Optical Cables and Products for Data Centres - Zarlink was the first to support volume production of innovative ZLynx optical cables for data center interconnect, and is one of top four suppliers of optical modules. - IP Telephony - Zarlink is one of three key suppliers in a large, stable market. - Dr. Adam Chowaniec has been a member of the Board since February 2007 and has a strong technical and business background. He is also the founding CEO of Tundra Semiconductor (to Dec. 2005). - Oleg Khaykin has been a member of the Board since November 2007 and has a strong technical and business background. He is President and CEO of International Rectifier and former EVP and COO of Amkor Technology. - Hubert T. Lacroix has been a member of the Board for 16 years and has a strong financial and legal background. He is President and CEO of CBC/Radio-Canada, a former partner of or counsel to McCarthy Tetrault LLP and Stikeman Elliott LLP, two of Canada's foremost law firms. He is a financial expert under the NYSE governance rules. - J. Spencer Lanthier has been a member of the Board since 2003. He is a former Chairman and CEO of KPMG Canada, sits on other public company boards and is a financial expert under the NYSE governance rules. - Kirk Mandy is Zarlink's CEO, having worked in many capacities for the Company for over 20 years. - Jules M. Meunier has been a member of the Board since 2002 and has had a 20-year career with Nortel Networks including Chief Technical Officer. - Dennis Roberson has been a member of the Board since 2004 and is Executive Director and Research Professor of Illinois Institute of Technology and the former Chief Technical Officer of Motorola. - Dr. Henry Simon is the Chairman and has been a member of the Board since 1992. He has been actively involved in the technology industry for over 30 years in both North America and Europe and is a Special Partner of SV Lifesciences. Our Board is highly experienced and skilled and actively participates in the formation of the Company's strategy and execution of its plans. 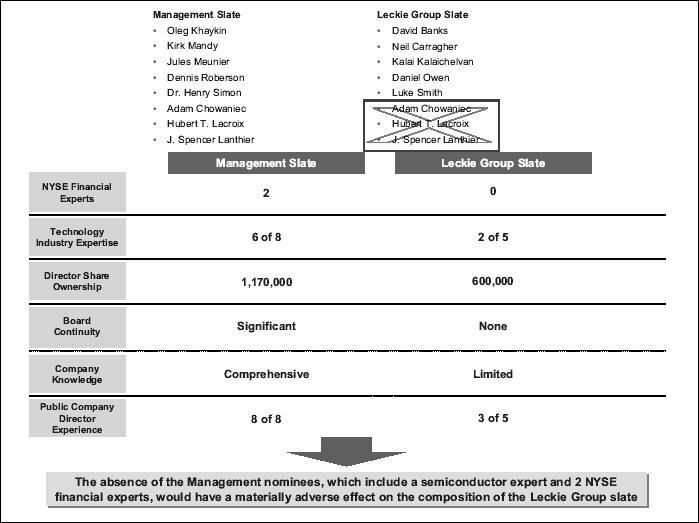 By comparison, it appears that of the five individuals nominated by the Leckie Group, only Luke Smith has worked in the semiconductor business and the Leckie Group's nominees including the proposed interim CEO, as a group, offer little experience in the technology industry in general. We believe this should be of significant concern to Zarlink shareholders. We question how a board composed of only five individuals with such little industry and Company knowledge would be able to provide adequate oversight of new senior management. Zarlink also has an effective corporate governance model in place that is in compliance with both Canadian and United States Governance requirements. It consistently gets very high ratings on its corporate governance from proxy advisory firms and other governance monitoring organizations. Zarlink is also an industry leader in transparency of financial reporting, financial guidance and communications with shareholders and the research community. Zarlink discloses financial results in four business segments and four geographies. The Company has met earnings guidance in the past 11 of 12 quarters, and regularly and actively engages shareholders and research analysts in an active dialog. This is consistent with, if not greater than the level of transparency provided by comparable companies. The trading pattern disclosed in the circular reveals that Mr. Leckie, Mr. Banks and Mr. Owen are, contrary to their claim, traders rather than long-term holders of Zarlink shares. Mr. Banks acquired his shares beginning in 2008 and Mr. Owen acquired the shares he owns only last month. In addition, while the funds Mr. Leckie manages have bought and sold shares over the last few years, the shares the Leckie Group and associates control have not been consistently held for the long-term, with 36% having been purchased since June 2007. Overall, in the past two years, the Leckie Group and associates have made many purchases and sales in Zarlink's shares, trading over 2.7 times the position disclosed in the Leckie Group circular. Zarlink's ability to succeed in its competitive markets requires focus, attention to detail and the support and guidance of an expert Board of Directors that understands our business and is up to speed on the many moving pieces involved in executing on our strategy. Zarlink's current Board is comprised of the right Directors, who understand both our industry and our Company. Mr. Leckie, Mr. Owen and Mr. Banks, who only control a combined 5.9% percent of the Company's shares, are seeking to seize control of the Board and replace the Company's CEO through an eleventh hour, costly and disruptive process. If successful, it is clear that the Leckie Group will seek to impose the costs incurred by them on the Company. These costs will be substantial. Zarlink's Management and Board of Directors strongly recommend that you reject the attempt by Mr. Leckie, Mr. Owen and Mr. Banks to take over Zarlink while offering no control premium and only a self-serving, short-term agenda. We urge you to support your strong and well-qualified Board of Directors by voting "FOR" the election of the slate of director nominees set out in the Zarlink Management Proxy Circular, a copy of which is available on SEDAR at www.sedar.com. Please discard any proxy or related materials you may receive from the Leckie Group and vote using only our YELLOW form of proxy. Voting is a very quick and easy process. To be effective, completed YELLOW proxies must be received by 10:30 a.m. on July 21, 2008. Due to the limited time available we recommend that you vote using one of the quicker options available as noted in the YELLOW proxy, preferably by Internet, telephone or facsimile, today or at least 24 hours in advance of the deadline. Please visit the Zarlink website for a link to the Internet voting site. If you have already voted using the dissident proxy you have every right to change your vote by simply executing and delivering the YELLOW proxy. It is the later dated proxy form that will be counted. If you have questions about voting your proxy or need additional information, please contact Zarlink's proxy solicitation agent, Georgeson (North American toll-free, 1-866-717-8088). On behalf of the Zarlink Board of Directors and Management, we thank you for your continued support and promise that we will continue to work hard on behalf of all our shareholders. Download a pdf of Zarlink's Letter to Shareholders. Certain statements in this shareholder letter constitute forward-looking statements within the meaning of the Private Securities Litigation Reform Act of 1995 and Canadian securities legislation. Such forward-looking statements involve known and unknown risks, uncertainties and other factors which may cause the actual results, performance or achievements of the Company to be materially different from any future results, performance or achievements expressed or implied by such forward-looking statements. Such risks, uncertainties and assumptions include, among others, the following: our dependence on the successful development and market introduction of new products; our dependence on revenue generation from our legacy products in order to fund development of our new products; our ability to successfully integrate Legerity and any businesses acquired in the future; any potential undisclosed liabilities associated with the Legerity acquisition; our ability to operate profitably and generate positive cash flows in the future; our dependence on our foundry suppliers and third-party subcontractors; order cancellations and deferrals by our customers; and other factors referenced in our Annual Report on Form 20-F. Investors are encouraged to consider the risks detailed in this filing.